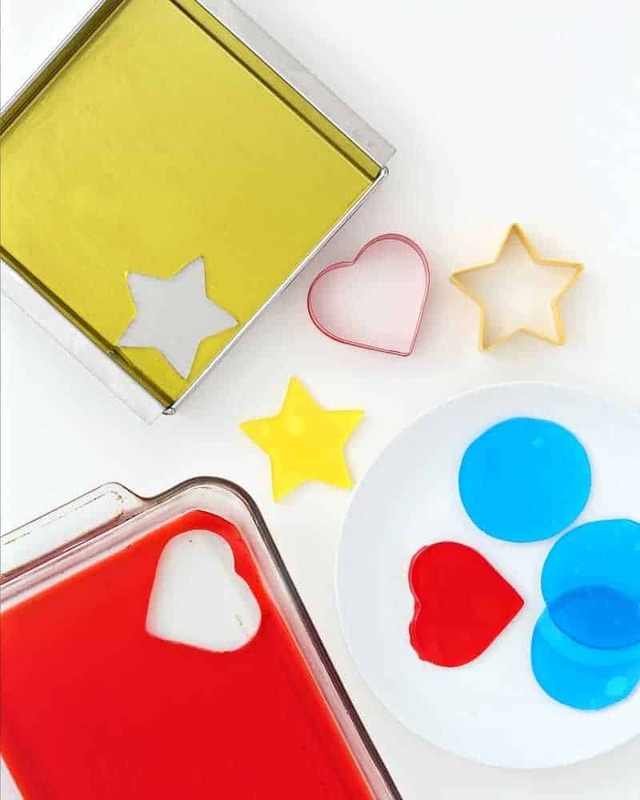 Find out how to make perfect Jello Jigglers every time with these helpful Jello tips and tricks. 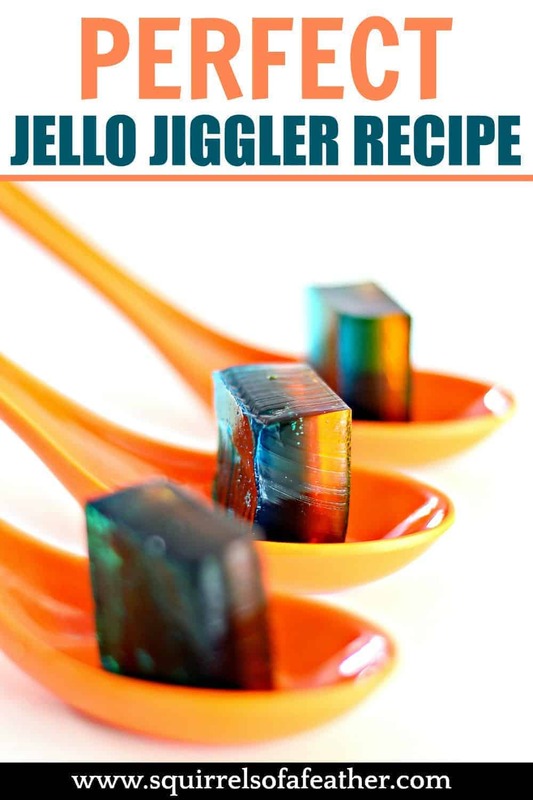 This Jello Jiggler recipe works for both regular Jello and sugar-free Jello Jigglers. *Don’t just skip to the Jello recipe — you will want to see all the helpful tips before you start to make the Jello! Jello Jigglers are everything that is wonderful about Jello; they are colorful, delicious, and tons of fun to make and eat! The perfect Jello Jiggler is firm and jiggly, but never hard. 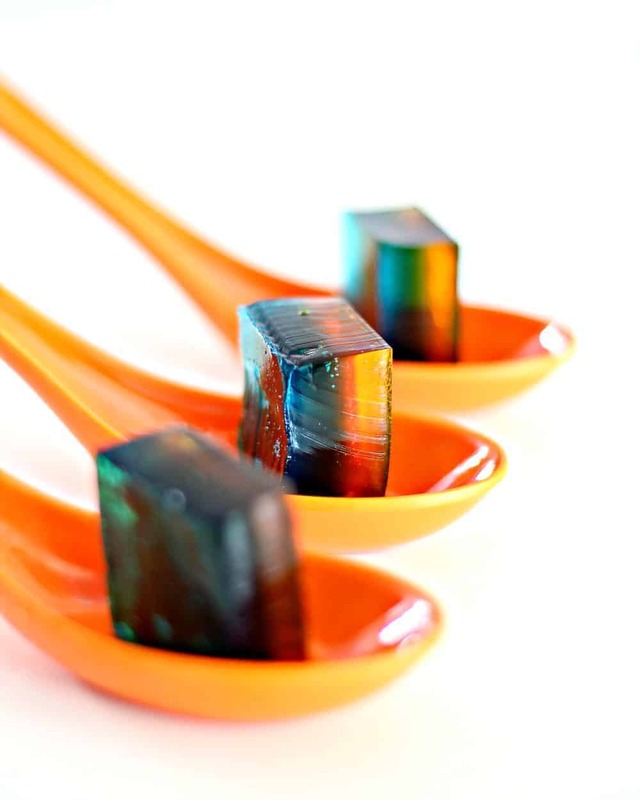 Jello Jigglers can be cut into neat cubes and shapes and still hold their form. 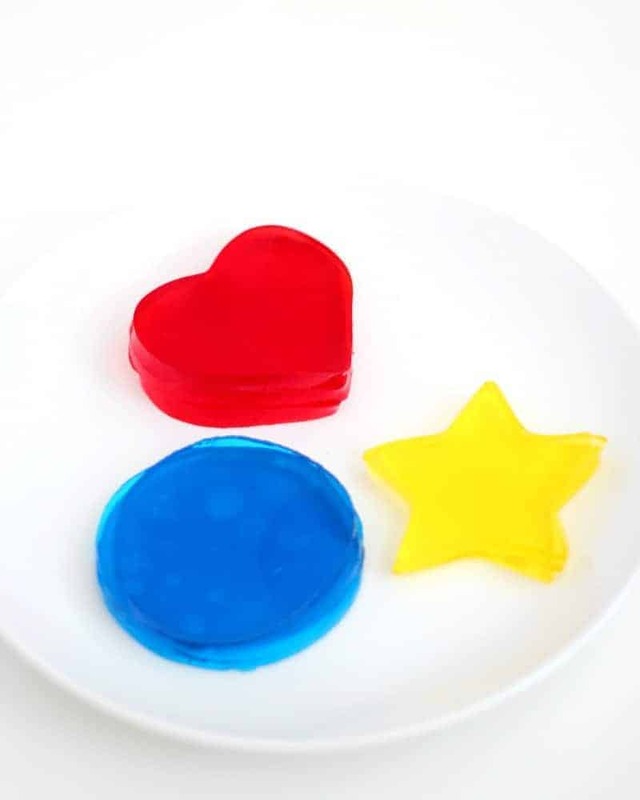 They make a great finger snack for toddlers and young children, who also love to assist with making and cutting the Jello. Making Jello Jigglers is less intuitive than you might believe; in fact, you will not follow the instructions on the box! 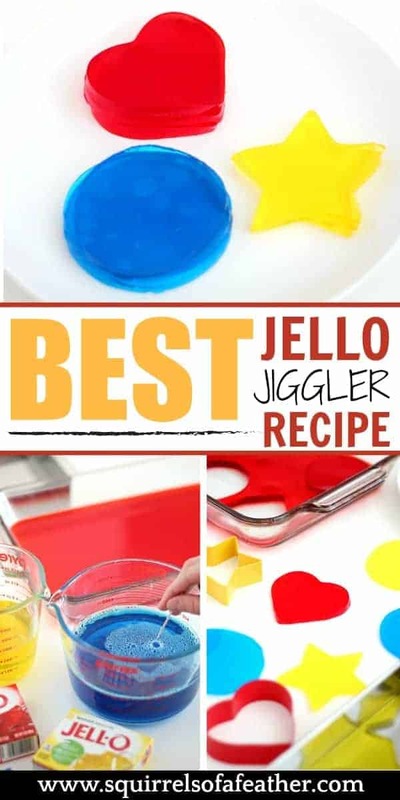 Read on and I will share the best Jello recipe for Jigglers and teach you how to make Jello Jigglers perfectly every time. You can even make multi-colored Jigglers! To make Jello Jigglers you will need the following items, most of which can be found at your local supermarket or even on Amazon. You can choose any flavor of Jello to make Jello Jigglers; you can also choose to make regular or sugar-free Jigglers. I tested both regular and sugar-free and did not find a big texture or taste difference. If you want to make one color of Jello Jigglers you will need two boxes of the same flavor (unless you want to layer it to make multi-color jello). 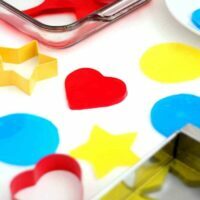 If you choose to make multiple colors at once, you will want a mold for each color (I used three separate molds to get yellow, blue, and red). Most people are used to making Jello with a glass Pyrex pan, but I also love to use my Japanese nagashikan mold for Jello Jigglers; a nagashikan has a four-sided outer pan and an inner pan that slides out and is open on two sides. Since you are able to pull out the inner pan it is just easier to cut the Jello into perfect cubes. Water to Jello ratio: For Jello Jigglers, keep the water-to-Jello ratio at 1:1; that means that for every ONE BOX of Jello you will need one cup of water. This is half of what the regular Jello recipe on the box requires. As a rule, the less water you add the stronger the Jello will be. 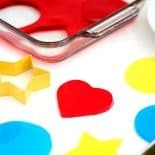 Don’t add cold water: Rather than adding cold water, as the directions on the box instructs, you are only going to use boiling water to make Jello Jigglers — this helps the gelatin molecules form a really strong bond and results in that strong and jiggly jello you love! Spray the pan with cooking spray before putting in the Jello: Before you add the liquid Jello into the pan, take the time to spray the pan lightly with a cooking spray and wipe it in with a paper towel. 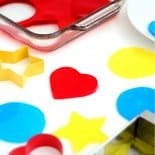 The spray will help stop the Jello from sticking to the pan and the wiping will help make sure the surface of your Jello is smooth since the little droplets of cooking spray can cause indentations in the Jello. Pop or scoop out any bubbles: After adding the liquid Jello to the mold make sure to pop any bubbles with a toothpick (or scoop out with a spoon). If you don’t, those bubbles will remain and you will get holes and divets in the top of your Jello! This doesn’t impact the taste, but can make it look rather uneven. How to get Jello out of the pan: Even with the spray beforehand, sometimes Jello can still stick to the pan — especially with glass pans! To stop Jello from sticking to the pan, fill your sink with 1-2 inches of warm water and place the Jello into the sink for 10-15 seconds (you only want a little bit, not so much the water spills over into the Jello). Remove and begin to cut into shapes. How to store Jello: To store Jello, place it in a tightly sealed container in the refrigerator; it should last 7-10 days this way. Boil one cup of water for every one 3 oz box of Jello. If you are making more than one color keep them separated. Add the water to the Jello and stir for two minutes until completely dissolved. Don’t forget to pop those bubbles! Spray the Jello mold or pan with cooking spray and wipe down. Slowly pour the Jello into the pan; you don’t want to create more bubbles!. Carefully place the Jello molds into the refrigerator for 3-4 hours or overnight. To stop the Jello Jigglers from sticking, place in the sink with around 1-inch of warm water for 10-15 seconds, then remove for cutting. 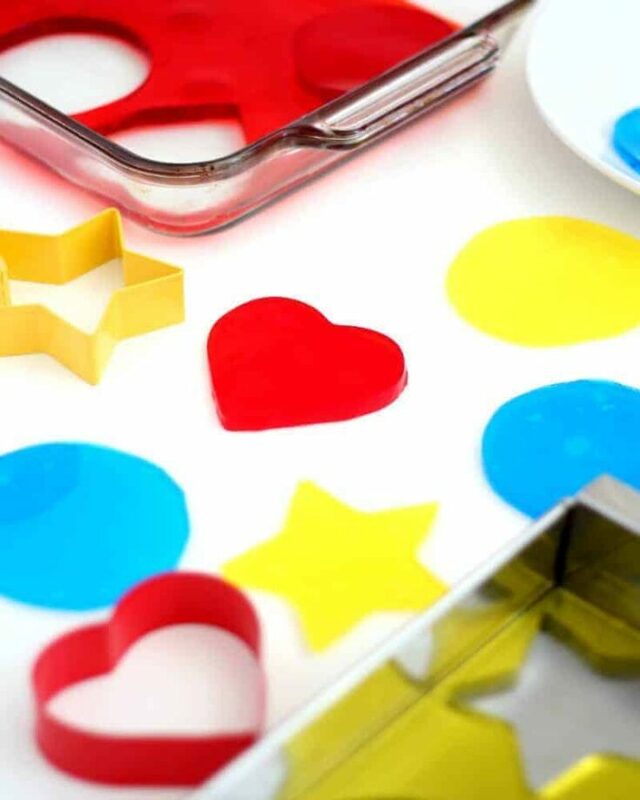 Use cookie cutters to cut Jello Jigglers into fun shapes or simply use a knife to slice into squares. Serve cold. Reserve the scraps for later snacking. I hope you enjoyed this Jello Jiggler recipe! Please take the time to leave me a review if you found this recipe useful; I LIVE for your reviews. The Jello Recipe That Could Save the World? Bring water to a boil. Add the boiling water to the dry gelatin and stir for two minutes until fully dissolved. Spray Jello mold or pan with cooking spray; wipe with paper towel. Slowly pour the Jello into the 9x13 pan or nagashikan. Poke/remove any bubbles. Place Jello into the refrigerator for 3-4 hours or until completely set. 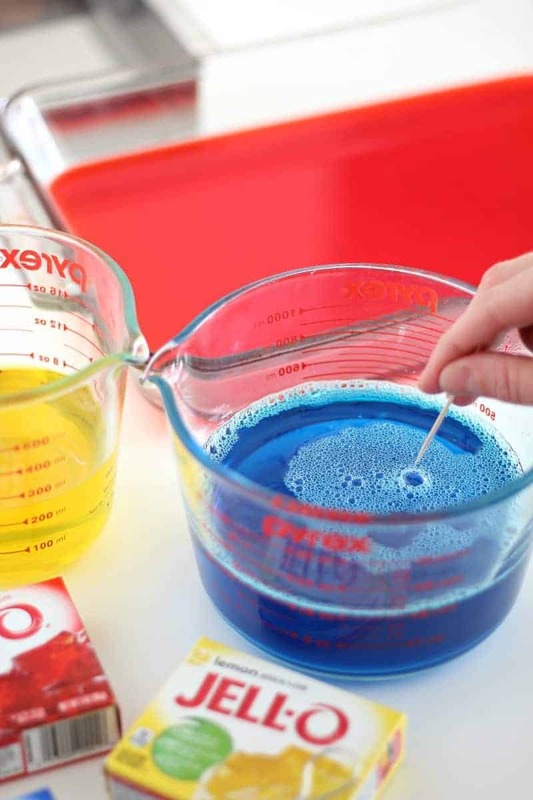 To remove Jello place the pan in 1 inch of warm water in the sink for 10-15 seconds, then remove. Cut and serve.